[spiritual ecstasy; state of God-union experienced as the ultimate goal of meditation] is a joyous experience, a splendid light in which you behold the countless worlds floating in a vast bed of joy and bliss. Banish the spiritual ignorance that makes you think this mortal life is real. The end of the world is realized in samadhi, or divine ecstasy. There are two kinds of samadhi. When at first you try to sit and meditate, your mind runs away in all directions. You think it is impossible to go deep. But if you sit still and persist long enough, you will begin to feel that wonderful silence of God. When your mind is withdrawn, centered in Him, the world is forgotten and you find in that silence a happiness greater than any worldly pleasure. That state, when you are totally absorbed in inner awareness of God, no longer conscious of the world, is called sabikalpa samadhi. It is "partial dissolution of the world" because, when you return to ordinary consciousness, the delusions of the world will again somewhat affect you, unless you are highly evolved and free of all desires and attachments. Into a vast ocean of blood of my own one Being. Tranquilled, unbroken thrill, eternally living, ever-new peace. Ocean of mind, I drink all creation's waves. I, in everything, enter the Great Myself. 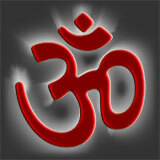 * Aum, the creative vibration that externalizes all creation. (4) sasmita ("with 'I-ness'" or individuality): intuitive experience mixed with a pure sense of being.